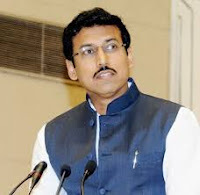 Union minister Rajyavardhan Singh Rathore welcomed the HRD Ministry's decision to reduce the syllabus in schools by half and making sports mandatory. While speaking at the 113th annual session of PHD Chamber of Commerce and Industry, Rathore said India can be the world leader by 2025. He also lauded the country's sports persons for their attitude and confidence at the world stage. "No government alone can do it. It's a collective effort," he stressed. Citing examples of sports persons who have done well, he said they have an attitude which he has not seen before. Hima Das, Swapna Burman, Sushil Kumar, Ravindra Jadeja, all are from the most humble background, he said. These are amazing examples of a country where people who had nothing have succeeded because there is tremendous hunger in them to achieve, the Sports minister said. "I am really proud that we have been able to take sports to the grassroot and elitist level. Believe me, I have never seen the kind of confidence and attitude of a champion that is so remarkably displayed in our athletes these days. He said youngsters are not just going and representing India in international platforms but claiming gold medals. This attitude is so new and fantastic, he said. Rathore also stressed on how education is not just limited to classrooms. "Recently, the education minister said they will reduce the syllabus by about 50 per cent and they are going to make sports mandatory. That's a welcome move. Even our prime minister says 'jo khelega, woh khilega'," he said. "Education is just not related to classrooms. There is a lot of it out in the playfield," Rathore said.